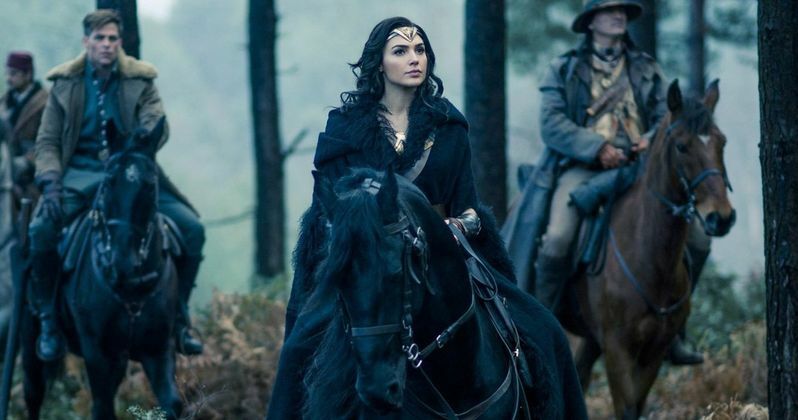 While we still have quite some time until the summer movie season kicks off, Warner Bros.' Wonder Woman may already be an early favorite as one of this summer's biggest movies. An international trailer released last week revealed some new footage, but it will likely be quite some time until another domestic trailer is released. While we wait for that to be unveiled, four new photos have surfaced, along with a set visit report that has seemingly confirmed a long-standing rumor about who the true villain really is. First off, the French magazine Studio Cine Live has released four new photos, while Les Etoiles Heroiques has translated their report from the set of this superhero adventure. The magazine got to speak with Chris Pine, who reveals some very interesting details about his character, Steve Trevor, during World War I. Here's what the actor had to say about what his character was up to before meeting Diana of Themyscira. These scientific formulas reportedly are for a "deadly gas" that could "wipe humanity off the map," with Diana Prince helping Steve Trevor retrieve this notebook. Perhaps the most interesting tidbit in this set report, though, is that Ares has seemingly been confirmed as the primary villain. After the new trailer dropped a few months ago, many fans started speculating that the unnamed character played by Danny Huston, who is a World War I German military officer, may actually be Ares, the mythological God of War. Here's an excerpt from the Studio Cine Live piece, which confirms that Ares is the villain, although it isn't said who is playing Ares. "Why did Zeus create the Amazons? Because shaping man in his image made his son Ares, incidentally a god of war, mad with jealousy, he convinces the guys to confront each other. To restore harmony between them, Zeus created the Amazons that Ares reduced to slavery. The Amazons revolt with the help of Zeus, who will die of the hand of his son having had time to find Themyscira, their haven of peace where they will grow Diana." Before she was Wonder Woman, she was Diana of Themyscira, princess of the Amazons, trained to be an unconquerable warrior. Raised on a sheltered island paradise, when an American pilot named Steve Trevor (Chris Pine) crashes on their shores and tells of a massive conflict raging in the outside world, Diana leaves her home, convinced she can stop the threat. Fighting alongside man in a war to end all wars, Diana will discover her full powers...and her true destiny. The supporting cast includes Ewen Bremner, Robin Wright, David Thewlis, Danny Huston, Elena Anaya, Lucy Davis and Connie Nielsen. Wonder Woman will hit theaters nationwide on June 2, going up against 20th Century Fox's animated comedy Captain Underpants. Take a look at the new photos from Wonder Woman, as we wait for the next batch of footage to debut.